Note: This novel is titled “The Night Watch” for the UK market and “Nightwatch” for the US market. Imagine a world where vampires, shape-shifters, werewolves, healers and magicians live side-by-side with humanity. The humans are none the wiser that they are surrounded by the Others; they can live and die without ever realising that they have been blessed or cursed by an Other. The Others can either be Dark, and do evil deeds or they can be Light, and pursue a selfless existence causing no harm to humans or Others. Some beings such as vampires are naturally Dark but sorceresses and magicians have the choice of which side they will fall on, although it is often just down to fate - how they feel on a particular day, to which side they will choose. The activities of the Others go largely unnoticed by the general population due to the strict set of rules that govern their behaviour. These rules were agreed upon by both the Light and the Dark after the last great magical war which neither side could win. These rules are enforced by the Night Watch – Others that are agents of the Light – and the Day Watch – others who are agents of the Dark. Set in contemporary Moscow, the story follows the activities of a mid-level magician and somewhat averagely talented Night Watch agent named Anton. Usually he works as a programmer at the Night Watch HQ but he is on his first field operation which is to track and stop a rogue vampire. A week of taking magical potions and drinking blood enable him to track the vampire as she ensnares her victim. Whilst following her trail he comes across a young woman on the metro who has a terrible curse hanging over her. Torn between helping the woman and saving the vampire’s latest victim he reluctantly has to leave the cursed woman to deal with the vampire but his mission goes wrong and the vampire escapes. This is just the start of Anton’s troubles. 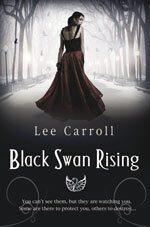 The cursed woman needs to be found before the curse gets any bigger and kills not only her but half of Moscow as well. The rogue vampire needs to be found and prosecuted and the boy that the vampire ensnared need to be protected because the vampire could get to him again at any moment. Set against a backdrop of political intrigue, posturing and manoeuvring - nothing and no one are ever quite what they seem. 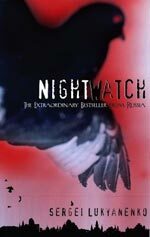 Nightwatch is the first part of an epic trilogy and in this instalment we see Anton start out as a somewhat naïve young Night Watch agent but end up cynical and hardened by his acquired understanding of how the powers of Light and Dark operate. Nightwatch hangs upon the original idea that the forces of Light and Dark are in a state of cold warfare. For any unconditional act of goodness that a Light healer or magician may perform there is an equal and opposite reaction. It gives the powers of Dark the right to do an equal act of evil or harm. There are a strict set of rules to make sure that the balance of power between the Dark and Light is kept static but it doesn’t stop either side from hatching plans that would give them an advantage. There are pawns on either side that can be sacrificed for the greater good or evil. Both sides exist in a state of compromise. For example vampires and werewolves (creatures of the dark) are licensed, they are strictly controlled over when and how they can hunt but the powers of Light can not stop a licensed vampire from killing its victim because it has a license to do so. In fact the Light and Dark jointly issue the licenses giving the vampires and werewolves the right to hunt a specific person which is ultimately depressing if you are an agent of the Light. It is a sad reality for Light Others that evil is always easier to choose than goodness and that the humans, that they work so hard to protect from unauthorised uses of Dark power, themselves find it easier to choose to do bad things rather than good. Anton is expected to give up the woman he loves to aid the greater good which finally leads him to question his whole belief in the work of the Light. Nightwatch is a highly imaginative and original fantasy thriller that somehow manages to combine fantasy with political thriller to good result. If you have seen the movie it is still well worth reading the novel because the plot covered by the film is about the first third of this book and the book explains things more clearly. I also think that the whole point of this book – good and evil battling it out cold war style - was slightly obscured by the film. Sergei’s website has more information about his writing career, plus you can read some of his short stories in English. Visit Sergei’s site.